The Petaluma Wetlands Alliance education program serves from 28-30 classes and 750-800 students each year. The program began in 2003, serving 300 students. Since then, PWA has served over 10,000 third grade children who attend schools in the Petaluma River watershed. To accommodate the number of teachers who wish to include our program in their curriculum, our program requires careful scheduling and planning. In August, each third-grade teacher in the Petaluma watershed is sent an invitation to participate in our two-morning program. Because the second day of our program takes place at Shollenberger Park, we schedule our classroom and park visits to bracket Petaluma’s traditional rainy season; teachers are offered dates from early October to mid-November and mid-March through mid-May. Many respond very quickly to hold their place. Our schedule for the entire year is filled by early September, and we typically do not have room for all the teachers who wish to participate. 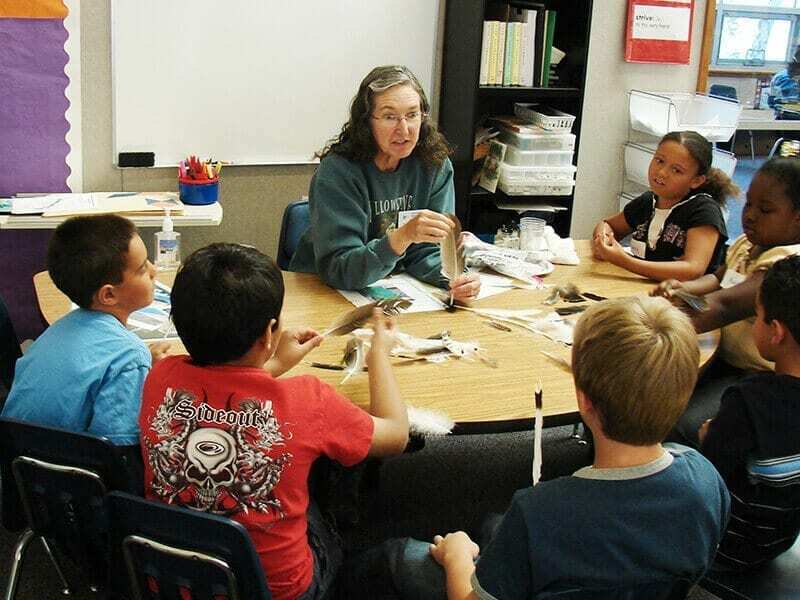 Designed to align with California third grade science standards, our program is delivered by trained and supervised volunteer docents. The content is consistent with our curriculum and helps tie together our science units. The goal of our classroom activities is to build knowledge and understanding of wetlands as systems of diverse habitats and adaptations. A second goal is to increase the student’s appreciation of the uniqueness and importance of our Petaluma River wetlands. The classroom activities are also designed to prepare students for the park experience. Students first watch a Power Point presentation that introduces them to the vocabulary, ecological concepts, and the plants and animals of Shollenberger Park. The Power Point also gives the students a preview of the four activities they will be doing, as they rotate, in groups of 5 – 7, through four, 15-minute, hands-on, interactive activities: studying feathers, beaks and feet, watershed and wetlands, and classifications. The purpose of the park visit is to help students understand the watershed they live in and the role of a wetland in a watershed. Field activities reinforce concepts and information introduced in the classroom activities and allow students to observe first-hand the park plants and animals in their diverse habitats. All park activities are interactive with plenty of time for questions and discovery. Students are divided into three groups of 7-10 each, and rotate through three activities: a habitat walk, a bird walk and a study of barn owl pellets and the original inhabitants of the area, the Miwok. Binoculars are provided as well as the opportunity to observe birds and animals through professional scopes. Love, love, love everything about the content and the people who share their time with us. My students look forward to understanding and exploring their “backyard.” It flows nicely with many things that we talk about throughout the year. This is a docent-intensive program! It takes 6 docents to cover each classroom visit and 7 docents to cover each class visit to the park. We have 30 dedicated volunteer docents who provide these small group hands-on experiences with depth of understanding and attention to each child. We ensure that docents are trained and supervised, and offer ongoing content development and training in instructional methodologies. We welcome volunteers for training, and value the varied gifts and perspectives of all our docents, but also recognize that we have a core of docents who are particularly deep resources for the program. This includes PhDs in relevant fields, retired and active classroom teachers, experienced facilitators and trainers, and two Spanish/English bilingual docents. These resources enable us to approach content, instructional methodologies, classroom realities, and a diversity of students with a sound base of knowledge and experience. The docents are always on time, great with the kids, flexible within the space provided during classroom visits and works around our recess and lunch breaks. We are lucky to have such a wonderful resource so close to our school site. Having the free cost of this program is amazing. Training materials, materials provided to teachers, and materials needed for hands-on activities, presentations, and guided exploration of wetlands habitats in Shollenberger Park require maintenance, replenishment and upgrading on a regular basis. We regularly need to replace our materials, which include everything from binders and flash drives for training sessions to child-sized binoculars, paper towels for cleaning up or plastic bags so each child can take home the results of his/her owl pellet dissection. It all adds up! My students valued the entire experience beginning with the classroom visit and then going to Shollenberger Park. They wanted to do it all again when you returned in the spring for another class. Thanks for all you do in offering this incredible experience to our students. "To remove skunk scent, the Humane Society of the United States recommends using a mixture of dilute hydrogen peroxide (3%), baking soda, and dishwashing liquid. "